Tomato pincushions are good enough to eat. I remember being a little girl and coveting my mother's. I liked the little baby tomato attached. I liked the compact smallness of it. I liked the ripe red color. Wouldn't a handmade one be a thoughtful unique gift for a crafty friend? 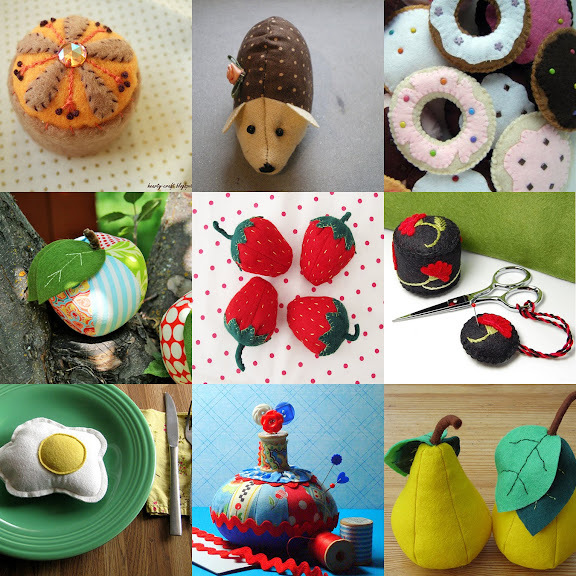 Here are some free pincushion patterns courtesy of tipnut.com. For more pretty pincushions to drool over check out The Pincushions Pool. I love these lists you make up! They are so handy! These are so cute :) I love them all ! Especially the egg, what an idea.. I just have a boring magnetic bowl for my pins. This is giving me new ideas !